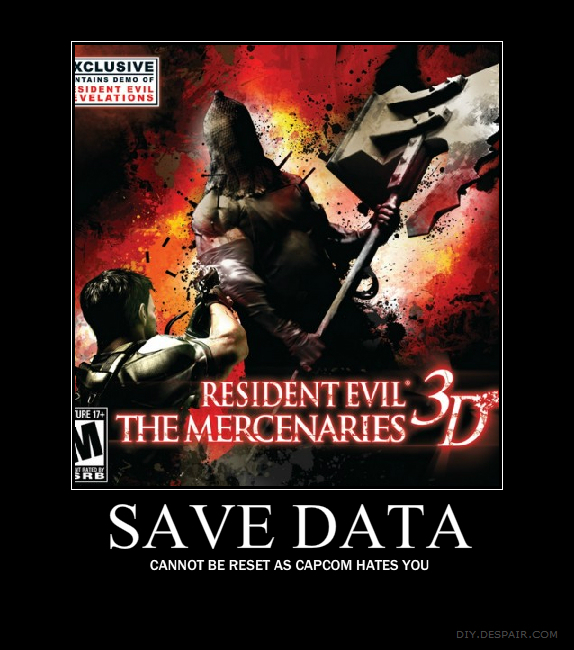 Basically what Capcom has done is make Mercenaries 3D a one-time play affair. Once you’ve unlocked all the goodies and played the entire game, you will not be able to erase the game’s save data and start fresh as if it were a new copy. Consider this: lending Mercenaries 3D to a friend, a little brother or sister will be worthless because they’ll only be able to continue playing the game with your saved settings and create their own. Capcom have made some terrible decisions with DRM in the past (Final Fight Double Impact and Bionic Commando ReArmed 2 need to “phone home” before you can play them on the PS3), and its disappointing to see them acting in such a hostile way towards consumers. While some may argue that this is potentially an act to sabotage second-hand game sales (as they derive zero profit from the on-selling of games once they’re past the first run at the retail counter), it’s important to consider the dependence many gaming stores have on second-hand sales in order to make up for the relatively slim margins offered at retail. Mind, I won’t go into that topic in more detail here, as it’s beyond the scope of this post and has probably been argued more intelligently elsewhere. Returning to the topic at hand, I think this hurts a little more as I genuinely have a soft spot for Capcom games, having enjoyed so many of them over the years (during the Saturn and Dreamcast era, my purchases [at retail no less] led to many gaming sessions). This is the kind of move I would expect from some of the more aggressive players in the market, but not from them. It also seems incredibly short-sighted in terms of being able to enjoy your purchase over time – I still crank out Atari 2600 cartridges every now and again, and the notion of anti-consumerist DRM would render this kind of thing impossible in years to come for new games. This means that, in the case of Resident Evil: Mercenaries 3D, I can’t reset the game back to factory settings to start it afresh; or to give another skew on this topic, in the case Bionic Commando ReArmed 2, I probably won’t be able to play it in 10 years time despite having paid money for it in 2011. It marks a very dangerous point on the slippery slope of DRM and anti-consumer licensing enforcement on behalf of gaming publishers. Whilst only a handful of games on consoles are toying with the concept of DRM that is ultimately detrimental to the gamer, it’s a dangerous path. I hope Capcom is taking stock of the reaction from consumers to what they’ve tried slipping through with Resident Evil: Mercenaries 3D and don’t attempt this kind of tomfoolery in the future.